Yossi Green does it again. Known for his famous compositions and unique style, Yossi teams up with Naftali Schnitzler and Moshy Kraus to create a truly magical experience. The boys who sing in this album have young yet rich voices. This combines with the masterful musical arrangements for incredible listening pleasure. Hiskabtzi: The words of this song are from hakafos on Simchas Torah. Sruly Laufer, the child soloist on this track, has a solid crisp tone and gives this hora track a truly powerful portrayal of malachim coming together “lamarom”! The boys choir is fantastic, and they sing together Yossi Green on this track. Atoh Kodoish: The child soloist on this song is Yoely Hirsch. He has a beautiful sweet sound. This songs starts with a rock ballad feel, with some emotional saxophone. The choir then takes over with such precision in this beautiful song. Ein Keloikeinu: Child Soloist Sruly Laufer. This is a very cool track. The song begins with vocals from Yossi Green being answered by the boys’ choir. The arrangements of this track give the hora feel a very fun feel. This is a great energetic song that the listener can really enjoy. Riboinoi Shel Oilom – Kemoi: The words from this song are taken from seder Karbanos. The child soloist on this song is Avrum Chaim Green. He has a very soft gentle angelic voice. The song is a ballad with a heartfelt plea to the one above to look down and give his people rachamim. This is simply beautiful composition. On this track, the choir sounds very mature giving the meaning of this song real depth. Matonoh Toivah: Child Soloist on this track is again Avrum Chaim Green. The words of this song, and title track of this album, are from the famous gemara in Meseches Shabbos along with yiddishe lyrics emphasizing the beauty of Shabbos. This track begins with a gorgeous piano introduction and opens into a unique hora sound. Mogain Ovois: Child Soloist Sruly Laufer. This track opens with a chazzanishe style from an adult voice. Followed by Sruly doing a beautiful job in his cantorial style solo that follows shortly afterwards. The initial choir in this track is an adult choir backing up the child soloist. The chorus “hameiniach” has a “Kah Echsof” feel to it. This is a gorgeous song for the Shabbos table! HaToiv: Once again the child soloist on this track is Sruly Laufer. He does a great job with the quality of his sustained high notes. This track is a freilach. In addition to the children’s choir, there is an abundance of Yossi Green vocals on this track. I can see this one hitting the wedding circuit. Zechoir Ahavas Kedumim: Lately, when I hear the words Zechoir Ahavas Kedumim, I think of the popular hora. This song takes a completely different approach. The child soloist on this track is Moshe Yida Eckstein. The track opens with a beautiful piano solo followed by the children’s choir. Then Moshe Yida has his first solo. Toward the middle of the song, you will hear Yossi Green vocals as well. The arrangements on this track are simple and pretty. The choir owns this song and does a beautiful job. Ki Lecho Toiv: Child Soloist, you guessed it Sruly Laufer. This is an incredibly fun hora track with a lot of energy! This track features both the children’s choir and adult choir. Sruly does a fascinating job taking charge of this song. Great song! Aderaba: Yes, you read that right, Aderaba. The child soloist on this track is Yoely Hirsch. 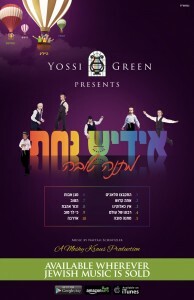 Yossi Green has taken a classic and reinvented it with this boys choir. They do an absolutely outstanding job and I think Aderaba will make its way back as a new “old” tune to be played during dinner sets at weddings. Yossi, Moshy, Naftali and everyone at OhYeah Productions, very well done.